The S813 reader combines Bioscrypt MV1200 fingerprint sensors with Philips Mifare and Mifare DESFire contactless smartcard chips to produce high-security front ends for access-control systems. 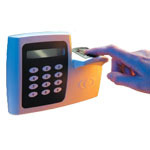 The smartcards store fingerprint templates; when cards are presented to readers, templates are read from cards and users are prompted to place fingers on sensors. Comparisons are made between live fingerprints and stored ones; if the two match, access is granted. S813 features BioScrypt MV1200 fingerprint sensors and typical Mifare and Mifare DESFire smartcard read range is one inch (2.5 centimeters). The S813 supervises bidirectional pseudo-random communications and integrates door pre-held warning buzzers. Audible feedback provides positive confirmation of card read; key-press LCD verification of both card and fingerprint accepted or rejected LCDs are also used for card PIN-number prompt to give verification of command functions initiated through reader keypads. Finally, it has two fingerprint and duress modes.